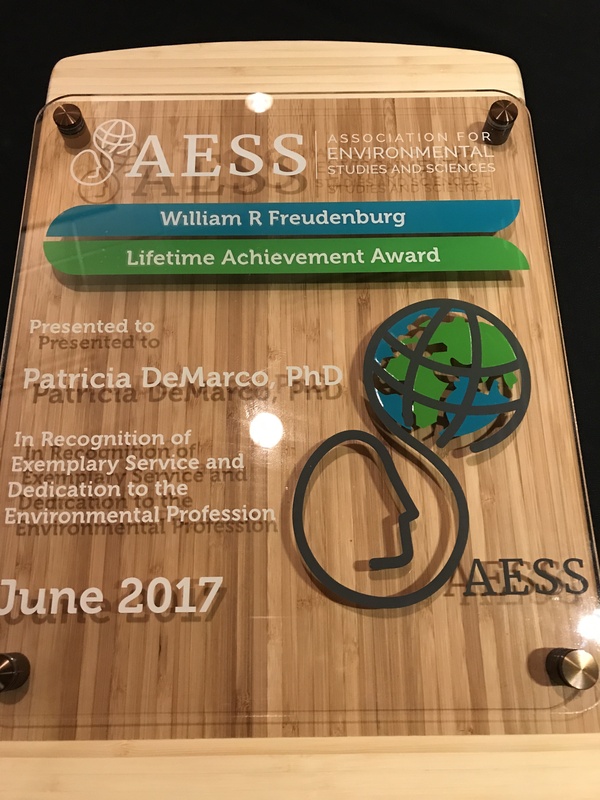 AESS Wlliam Freudenburg Lifetime Achievement Award Acceptance- Moving from Awareness to Action | Patricia DeMarco Ph.D.
Patricia M. DeMarco, Ph.D. Visiting Researcher and Writer, Carnegie Mellon University, Senior Scholar at Chatham University and Council Member of Forest Hills Borough Council, 2016-2020 was given the 2017 William Freudenburg Lifetime Achievement Award. It is with great humility and gratitude that I accept this award made in honor of AESS founder William Freudenburg. I did not have the pleasure of knowing him, but in looking at his work, I recognize a kindred spirit in the battle to connect the systems thinking of ecology and the problems of society. Receiving this award has surprised me because mine has not been a traditional academic career. Indeed, a promising beginning in the early days of molecular genetics was derailed when I stepped off the tenure track for four years to have two children in close succession. Then I found out that there was no way to go back. Receiving a doctorate in biology prepared a person to expect a career in research and teaching where merit is determined by the number of peer-reviewed publications, the size of research grants received and the number and prestige of graduate students mentored. All of that was suddenly closed to me. I was supposed to become a nice doctor’s wife doing good works and keeping a place in society. Right! I was looking through the newspaper for jobs and came across a small advertisement in the Hartford Courant: ”Vacuuming- $3,000 per hour” from Northeast Utilities. It turned out to be a call for people to be trained to vacuum up radioactive spills at Millstone power plant, and I was deemed unqualified. So I sent a neighbor’s 20 year-old son to collect all the paperwork and SIGN NOTHING, and I took the whole thing up to the Connecticut Legislature Energy and Commerce Committee and asked for an investigation. As a newly minted Ph.D. in genetics, I held my own with the Northeast Utilities lawyers, and legislation was passed for nuclear power plant workers protection. I finally found my place in society: as a translator between lawyers, engineers and economists; as a citizens voice for policy to protect workers and communities; as a policy analyst bringing science to weigh on energy, environmental, and social justice actions. The skills acquired through a thorough liberal arts education and the discipline of achieving a doctorate, post-doctoral research position and fellowship in biology turned out to be transferable to a wide array of non-academic pursuits. I struggled throughout my career to maintain connections to the academic world I love. If I have been successful in these endeavors at all, it is because of the roots of my training. First, I inherited my Father’s poet heart and understanding of the power of well-chosen words; from my Mother, the spirit of rebellion to stand for those without voice and the value of organizing. Most critically, I was raised in an environment that encouraged curiosity and discovery under the tutelage of my wise Nona whose lessons in patience, generosity and compassion crossed generations. Hers was the lesson that sustained my course when roadblocks loomed: “The men may rule, but women govern,” she told me. I watched how all the major decisions of the family took place over the dinner table on Sundays, my Pop decreed, but my Nona guided the discussion that shaped his pronouncement. In receiving this award I have puzzled over my connection to the academic world. While Will Freudenburg made great efforts from within academe to reach into society, my problem has been the reverse. I have been immersed in society, bringing academic training to the problems encountered, and have had to reach into the academic world to remain connected. Of the many colleagues I have worked with over the years, Dave Hassenzahl while Dean at Chatham University and Terry Collins, the Theresa Heinz Professor of Green Chemistry at Carnegie Mellon University have helped me in bridging this divide. Mark Collins at the University of Pittsburgh gave me an adjunct teaching position for a course on directed study in science, ethics and public policy, which became the basis for my book. The situation of the world today has never needed more advocates and systems thinkers to address the confluence of problems humanity has wrought upon itself and upon the whole living Earth. I believe that we who study ecosystems and sustainability have a unique capacity to shape a new direction toward solutions. In a world wildly out of balance from the ideal of sustainability where environment, economics and culture are mutually supportive, the economic parameters dominate all else. The problems of our time derived from human enterprise – global warming and global pollution with synthetic materials – are not technology problems, for many of the solutions are well known and within reach. We are facing an ethics problem. It is time for us in the sustainability profession to move from awareness to action. Our path cannot remain within the academy, safe in the halls of universities and colleges. Communicating important findings about the state of the living systems of the Earth must reach beyond the peer-reviewed journals that are the currency of the academic realm. In a political atmosphere charged with “fake news” the line between reality and fiction has blurred. But the laws of Nature are not negotiable. Chemistry, physics and biology will prevail regardless of political declarations or legislated stupidity. We as scientists have a tremendous task to bring facts to the front of the discussion, to engage the conversation not only in the classroom but also in the living rooms where families gather, in the churches and social gatherings, in the union halls, in the neighborhoods where people talk to each other. Climate change is one of the most pressing issues of our time, but it is not discussed. We need to break it down so it is less intimidating. We can begin to understand how to preserve the gifts of this living Earth for another generation. There are four ways to move from awareness to action effectively. Set an example, and talk about it. We are facing global challenges of climate change and pollution, so people think their own efforts are too insignificant to matter. It all matters. Every plastic bottle dropped on the street can end up in the great plastic gyres of the oceans. Use your own non-plastic bags, and give the little homily to the vendor. Decline the BPA laced receipt, and ask the vendor to wear gloves to protect their own exposure. You can imagine millions of ways to do this. Street theater works! Make it OK for successful white guys in business suits to bring a recyclable bag to the store. When building new campus or municipal facilities, use a net zero energy design and include citizen information in the lobby. Inspired by the Phipps Conservatory Living Building and the Chatham University Eden Hall Campus, my town of Forest Hills Borough is building a net zero energy municipal building. So far, four other communities have come to us asking for ideas. Reach out to those who are not at the table. The environmental NGOs are mostly headed by white men, and the environment movement in general has been characterized as the domain of left-leaning, spoiled, white, rich people, mired in 1970s thinking. But all around us, the environmental justice issues and the social justice issues involve much broader communities. The people affected by a shift from fossil based energy and commodity production hold a disdain for “tree huggers” and “snail lovers.” The “Shoot, shovel and shut up” approach to endangered species is alive and thriving. This divide was never clearer to me than at the demonstrations around the EPA hearing on the Clean Power Plan in Pittsburgh. 3,500 United Mine Workers sent off by Governor Corbett flooded the street in waves with uniform T-shirts and pre-printed signs chanting in cadence with a sound truck. Clustered on one corner of Grant and Sixth, were a motley gathering of about 300 environmental activists, mothers with toddlers in strollers, Buddhists giving out free ice cream, and Mayor Peduto urging a view to the future. I stood on the coal miner’s corner with my friend, labor historian Charlie McCollester who held a sign that said, “When Blue collar workers fight clean earth health we are all doomed.” Following that dramatic day, I sat down with Charlie, and we discerned together that what the miners are protesting is not against the environment, because they are indeed the most viciously affected victims of the effects of mountaintop removal mining. They are protesting out of fear for their future. What becomes of their pensions when no more coal miners pay into the system? How will they support their families? What will become of them when they get sick, as they inevitably will from being in the mines? We hatched a plan to help working people visualize what a transition can look like to a more sustainable future with a radio program called “Just Transitions- Labor, Environment and Health.” On the Union Edge- Labor’s Talk Radio Station twice a month I bring guests to talk about how communities are making transitions, about environmental and health issues, like reducing exposure of workers to BPA in the workplace, or fracking fluid contamination. After a year of this, we kept running out of time in the 30 minute format, and I wanted to take on more complex issues that would help people visualize what a sustainable future would look like. So, we launched The New American Economy program, which airs every Wednesday from 1:00 to 2:00 Pm EST. Here we talk about emerging issues in energy, food and water, manufacturing and supply chain and transportation. You can find both programs attheunionedge.com We reach 300,000 people a week in 33 cities and have 15,000 to 20,000 podcast downloads a month. If you want to carry the program on your campus radio, or if you have something exciting you would like to share with a working families audience, let me know. Union working people, coal miners, farmers, beauty shop operators, store keepers are highly unlikely to come to a class, presentation or lecture about climate change, environmental health or endangered species. But, they listen to the radio, they send questions, and they talk about it later. Engage with the community you are in. Ultimately, all of politics is local. Whether large cities like Pittsburgh or small boroughs like Forest Hills, communities need the expertise and engagement of the sustainability academic community. There are many ways to be involved and make a difference. Go to your local governing council meeting and find out what issues they are coping with. It is mostly mundane stuff- police contracts, fire service, swimming pool management, garbage. But some issues are really important- storm water management and meeting health and safety standards, establishing an environmental review for new developments, how pest control is managed, how transportation access and recreational open space are managed, strategic plans for land use, education of children. Democracy is not a spectator sport. Get involved yourself and empower your students with the tools to participate in the public policy process. Take them to a public hearing; teach them about stakeholders and power brokers. Consider running for office yourself. Know that public policy management is not the same as business management. The public interest goes beyond economic profit. Governing in the public interest must reach the wellness of the community, the collective well-being of people living together in a community of care. Governing in the public interest preserves and maintains the robust functions of the ecosystem that hosts the community. It attends to the needs of the youngest, the oldest and the most needy of the community and preserves fairness and justice but with compassion and kindness to neighbors we see every day and know. It must look to the future and anticipate the needs of those yet unborn whose lives are affected by decisions made today. We as Americans still think of ourselves as the defenders of “Freedom,” but freedom is not free. Freedom without responsibility yields chaos. And Freedom without accountability yields tyranny. I will close with Rachel Carson’s admonishment to the Garden Club of America: “We must be very clear about what our cause is. What do we oppose? What do we stand for?” Those of us who know have the obligation to speak. Those of us who know have the obligation to lead. Thank you. Categories: Call to Action | Tags: academic activists, AESS, Climate Change, freedom, inclusiveness, Sustainability | Permalink.